Keith Olbermann Calls Betsy DeVos A ‘Motherf…..’ – Is This The New Normal? 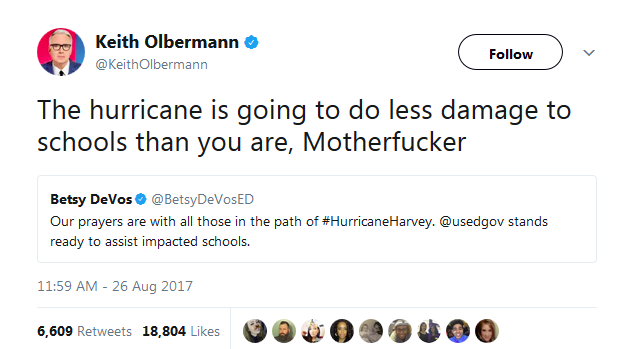 While the rest of the world was sending their thoughts and prayers to those who were forced to endure Hurricane Harvey, Keith Olbermann was busy proving to the world that his ability to be a complete and total douchebag does not end where the rain bands begin. In fact, he jumped beyond being an average, run-of-the-mill jerk to being straight up mysogynistic. I assure you that if a Republican had said this about a liberal female during the Obama administration, he would have been banished to some island in the middle of nowhere until he became a feminist. 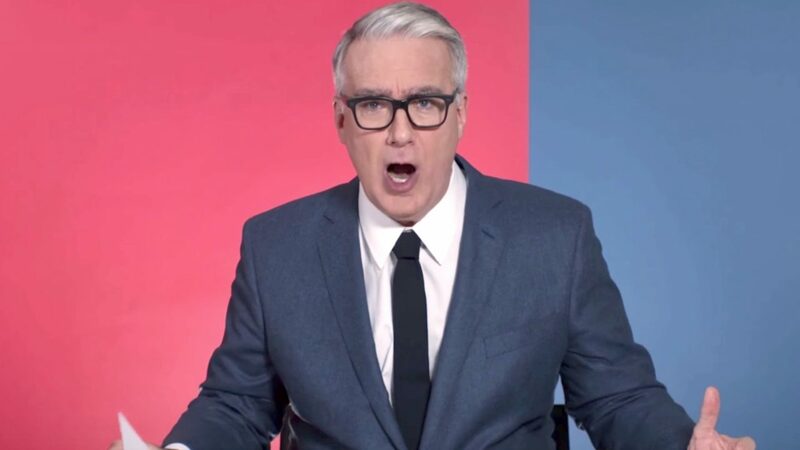 But now we have the human failure that is Keith Olbermann to show us that if it weren’t for double standards, some liberals would have no standards at all. Education Secretary Betsy DeVos issued a tweet stating that her prayers are with those suffering from the effects of Hurricane Harvey. It was a heart-warming tweet that should have united everyone, left and right, in prayer. Our prayers are with all those in the path of #HurricaneHarvey. @usedgov stands ready to assist impacted schools. Instead, the left-wing lunatic Olbermann decided it was necessary to not only complain about her doing her job, but curse at her as well. Class and respect for women is over-rated anyway. This is what feminism is about anyway, being able to call women “motherf*ckers” when you disagree with their politics. But let’s be honest, conservative women aren’t considered “women” by liberal definition. It’s okay to treat us like garbage because our politics make us fair game. I wonder how many liberals are going to come out and condemn his behavior toward DeVos. Should I hold my breath? Probably not. I can’t wait to see what other “woke” gems he pops out on Twitter. He is just an insufferable punk and it’s good to see him revealing who he truly is for the entire world to see. Perfection.